In 1921, Christopher Robin Milne received a stuffed bear for his first birthday. But it wasn’t any old stuffed bear. Bought at Harrods in London, this bear (named "Winnie" after a black bear that resided at the London Zoo) would inspire his father, A.A. Milne, to write the Winnie the Pooh stories in 1926--stories that have captured children's imaginations ever since. In the picture above, you can see the original Winnie the Pooh bear, joined by his friends Tigger, Kanga, Eeyore, and Piglet. They all now live at The New York Public Library, where kids and adults can see them on display. It should be noted that Roo isn't in the picture because he was lost a long time ago. Meanwhile you won’t find Owl or Rabbit, because they weren’t originally based on stuffed animals. 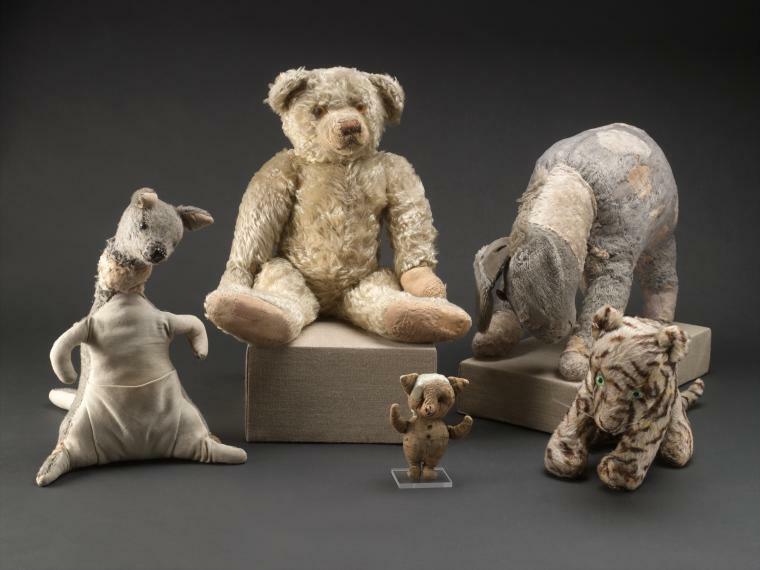 You can find more photos of the stuffed animals over at the NYPL website, and, if you visit this post in our archive, you'll hear A.A. Milne reading from Winnie the Pooh in a 1929 recording. Enjoy. Note: Do you want to download Winnie the Pooh as a free audio book? If you start a 30 day free trial with Audible.com, you can download two free audio books of your choice. Get more details on the offer here. This is untrue. Winnie the Pooh was inspired by a live bear named Winnie, in the London Zoo. Winnie was originally from Canada, and named after the city of Winnipeg. Christopher Robin used to love going to the zoo to see the bear. Yes, the bear at the zoo figures into the story. But it seems to me that the stuffed animals are the key to the story. First, they create the wider set of characters. (It’s not just the bear that matters.) And, second, they create the basis of the illustrations/artwork and the children’s fantasy world that Milne created. Care to dispute that? Gopher isn’t in the picture because there is no Gopher in any of Milne’s stories. Gopher appeared in the movie adaptation, which people are pretty familiar with. But I guess that might muddy things, so I edited it out. Chris, you need to read the article before commenting. Oh, apparently the info about the real bear was put in afterwards. I am assuming that Chris has never read any Winnie the Pooh stories or he would have known better than to waste time highlighting such a point… when he could have been eating honey.